When leaders from seven of the major industrial countries, known as the G7, meet in Canada, it will likely be the G6 and the United States. Canada’s finance minister Bill Morneau says the focus of the meeting will be on trade – especially what he has called U.S. President Donald Trump’s “absurd” tariffs. Canada, France, Germany, Italy, Japan, Britain and the U.S. make up the Group of Seven (G7). The group meets yearly to discuss issues like the international economy and security. Last week, Trump announced the U.S. would put tariffs on steel and aluminum imports from Canada, Mexico, and the European Union. Trump called the tariffs part of “fair and reciprocal trade.” But Morneau says he expects the G7 will continue to try to pressure the U.S. to reconsider. Trump has recently angered other G7 leaders over other issues, too. Last month he withdrew the U.S. from a deal to monitor Iran’s nuclear activities. And his efforts to improve ties between the U.S. and North Korea risk pushing Japan aside. French Finance Minister Bruno Le Maire spoke to reporters on Friday before meeting with other G7 finance officials. “What this G7 is going to show is that the United States are alone against everyone and especially alone against their allies,” he said. 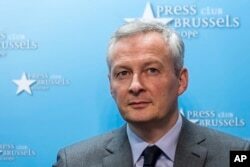 FILE - France's Finance and Economy Minister Bruno Le Maire speaks during a media conference regarding steel tariffs in Brussels, March 12, 2018. In addition to the economy, business investors want G7 leaders to talk about strengthening national plans to cut greenhouse gases and end the use of coal. However, Trump has resisted these efforts before. He does not believe that severe weather changes are the result of human activities, and he wants to support and grow the U.S. fossil fuel industry. Canadian Prime Minister Justin Trudeau is hosting this week’s G7 leaders summit in the Quebec town of La Malbaie. He played down talk of division at the meeting. Instead, he said, the summit was a chance for “like-minded nations to come together and talk about shared challenges. But one expert says the divisions on trade will make focusing on other issues hard. Heather Conley is a former U.S. State Department official, now with the Center for Strategic and International Studies in Washington, DC. “They’re either going to struggle through this and remain relevant to the management of the international system as it continues to evolve – or they’re not,” she said. 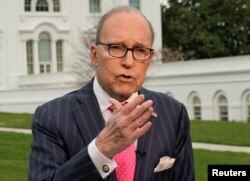 ​But Trump economic adviser Larry Kudlow suggested the stakes were much lower. He said the tensions over trade were more like a family quarrel, and that leaders could overcome their differences. The meeting will be held June 8 and 9 in La Malbaie, Quebec, Canada. The Associated Press reported this story. Kelly Jean Kelly adapted the report for VOA Learning English. Hai Do was editor. stakes - n. something (such as money) that you could win or lose in a game, contest, etc.